they look great , very un red box like .. hopefully more releases .. I JUST made a unit of these guys by swapping the Italeri heads with HaT bodies. Damn. These guys look a LOT better. I'm not Marc, but I'd say they look realistic for the period in question. It must be noted, however, that very few grenadier regiments wore the miter in this period. I made a list of them, but not at hand. The grenadier bns. of the Narva and Old Ingermanland musketeer reg'ts. had them at Austerlitz. Supposedly The Moscow grenadier reg't., and the grenadier bn. of the Valdimir musketeer reg't. were wearing them at Eylau. Now if the Moscow grenadier reg't. 's grenadier bn. was still in mitres does this mean that the two fusilier bns. were still wearing fusilier caps? Would the fusilier bns. of the Pavlov grenadier reg't. be still wearing fusilier caps? The old Italeri set had rectangular backpacks. These have the old cylindrical knapsacks. And if there are subtle variations in the poses, then head swaps would produce yet more pose variation. Pauls – where did you get these pictures? I can't even find a Redbox site that lists these figures. Pauls – where did you get the image of these figures? The Boxart is either direct from Redbox or a russian Forum, the Scans, the russian Forum. Thanks for the redbox site addy. A look at PSR shows that Redbox has notoriously terrible horses, and riders who don't fit the saddles. I mention this in anticipation of upcoming Russian Cavalry. I do hope they have improved and those sets, if they come, look better than PSR reviews would indicate. I agree. Nice site, by the way. Great painting. I'll keep my fingers crossed for good early Russian Cavalry. Aren't the HAT Russians for this period actually grenadiers because of the plume? To make them line you would have to cut off their plume. For me the mitre is still attractive and worth having if mixed with the HAT figures. Very few Russian grenadiers were still wearing the miter in 1805, and fewer still after that (see the post by Major Bloodnock above). By 1812, the Pavlovs were the only unit. 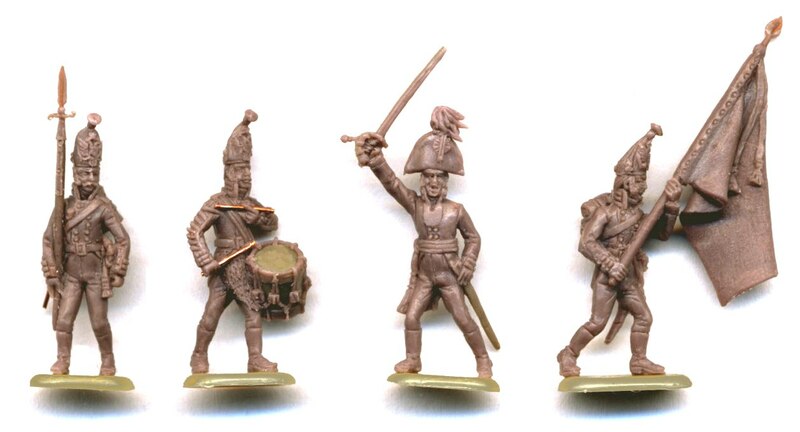 Interesting that of all the figures made wearing the miter, nobody has ever made a set with fusilier miter caps – a slightly smaller version of the grenadier miter. They can't really be "mixed" with shako wearing grendadiers, at least in the same unit. And the conversion from bush plume to musketeer isn't just as simple as cutting off the plume. There is a little pompom up there in place of the plume. I've done that conversion from the HaT grenadiers, and it's a pain! So great to see Redbox come out with a set of early musketeers with this pompom. Yes, the fusilier bns of grenadier regiments in miters all wore the fusilier miter cap. I just got a set of these in the mail the other day. Great proportions, detail. They look just a tad smaller than other 1/72, but I'll try to get a few painted up and upload some comparison shots – soon. Right now I don't even have a work space, so be patient.